Sexual harassment at work is against the law. It is against the law for an employer to discriminate against you because you are or may become pregnant. It is against the law for an employer to discriminate against you because of your responsibilities as a carer. Do you believe you have experienced sexual harassment, pregnancy discrimination or discrimination because of your family responsibilities? Working Women’s Legal Service on (02) 8745 6954.
circulating or displaying emails, texts, posters, magazines and screen savers of a sexual nature. Even if these things are not directly aimed at you, it can still be sexual harassment. It is against the law for an employer to discriminate against you because of your responsibilities as a carer for children, or for other family members who might need you to care for them such as a partner, parent, grandparent, grandchild or sibling. requiring all staff to start and finish work at a particular time which is more likely to negatively effect people who have responsibility for dropping off and collecting children from school. It is against the law for an employer to discriminate against you because you are pregnant or because you may become pregnant. 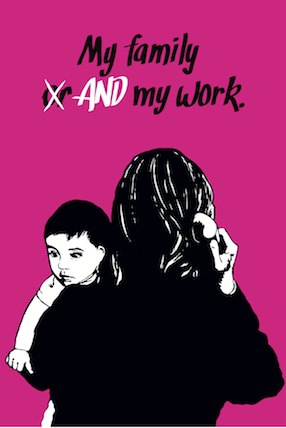 not giving you the same or similar job when you return from parenting leave. 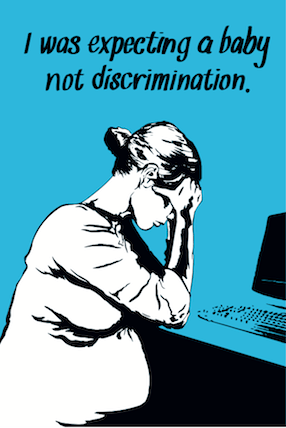 Everyone has a the right to work free from discrimination. To order postcards or posters visit the brochures and cards page or contact WLS reception.